Small round top limestone funerary (?) 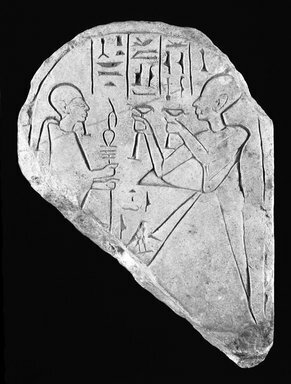 stela of the 'Servants in the Place of Truth, Hy-nfr (Huy-nefer)' making an offering to 'Ptah, Lord of Truth' to the left in the form of a mummy grasping a scepter. Inscription: 4 column at top of stela reading (1) Ptah, Lord of Truth (2). The Servant in the Place of Truth (3) Huy-nefer (4) justified. One column below figures; his father Hori. Condition: Lower left corner practically about one-quarter of entire piece missing. Edges badly chipped. Workmanship mediocre.